MERIDIAN, Idaho, Feb. 12, 2019 /PRNewswire/ -- CBH Homes' North Ada Sales Office located in Meridian, Idaho was broke into on Thursday, January 24th around 7am. The homebuilder had recently installed Video Ring Doorbells throughout their offices to help provide security and reassurance to their sales team. The thief had approached the front door, rang the Ring Doorbell, then continued to cover the camera. The Ring Video recorded his actions and caught his face on the camera. The thief then proceeded to break in the back door and stole items until he was deterred by the home's alarm system. 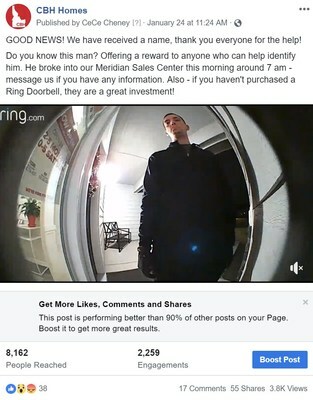 CBH Homes posted the Ring Doorbell video on the Ring App and on Facebook asking for any information identifying the man. Within a few hours, 55 people shared the post reaching over 8,000 people. CBH Homes quickly received a direct message on Facebook identifying the man in the video. "We don't have problems often with break-ins, but it's a top priority for us to keep our team safe. The Ring is a great option to capture people and help deter burglars from thinking about breaking in." said, Ronda Conger, Vice President of CBH Homes. A study done in the Los Angeles area with Ring Doorbell and the Newark Police Department showed that neighborhoods equipped with Ring have proven to reduce home burglaries up to 50%. Without the community or Ring Doorbell, the police might still be looking to identify the man. This incident has spurred CBH Homes to offer a Video Ring Doorbell to all buyers who purchase a home in February. Technology is an important feature in a home's security and the Ring products are effective tools. It was an easy choice for CBH Homes to make. Ronda Conger elaborated, "We love this community, we love our buyers, and we love RING. It was an easy decision to spread the love, and our thanks, this February with the Ring Video Doorbell." CBH Homes has been building dreams for Idahoans for over 25 years, and for 17 of those, CBH Homes has been Idaho's #1 Builder, an Idaho Best Place to Work, and proudly working with over 18,000 happy homeowners.